Will tastier recipes, better decorations, or creamier gravy make this the best Thanksgiving ever? The secret is not in the way we cook it or decorate it. Success is in the way we bind it! Traditions are the tie that binds, and moms who possess this genius talent gain more applause than even the creamiest gravy. Tradition #1: Get everyone involved. This is easier said than done since Thanksgiving lineups often includes various ages. Involve the youngest/oldest guests by having them ceremoniously play the first Christmas music, light the Christmas tree, serve the dessert, offer a prayer, or recite/read an appropriate selection. Get the men involved by providing outdoor game ideas they'll enjoy playing with the kids. Even better, offer the men a dishwashing competition of their own. Do this by hiding gift cards in hand towels, on dishwashing liquid, or under serving dishes. Ring a bell to announce the winner. Ask each family member to pick a can't-live-without side dish, then have them help you make it! Tradition #2: Express your thanks. This is the tradition with the greatest binding power. Some families hold hands and pray together. Some families keep a Blessing Book or Blessing Tablecloth where each person notes one blessing every year. Previous entries are read to help little ones understand the depth of God's faithfulness. Other families read, memorize, and recite portions of Scripture together. Tradition #3: Get everyone moving. Exercise is a great way to balance a holiday whose main attraction is food. Many families play touch football, wiffle ball baseball, or enjoy a hike. Thanksgiving means both thanks and giving. Invite a college student, a widow, or a young couple to your family's celebration. Deliver tasty leftovers to those working at the firehouse or police station. Have your kids donate a box of toys for children spending Thanksgiving in the hospital, shelter, or children's home. Tradition #5: Make it memorable. Make it memorable by taking particular family pictures every year (the kiddie table, the guys sleeping, the outside games). Award prizes (write winner's name inside box lid of board games or engrave best appetizer/dessert winner on silver ladle). Watch the same movies (Charlie Brown Thanksgiving, It's a Wonderful Life). Forget about the perfect gravy. 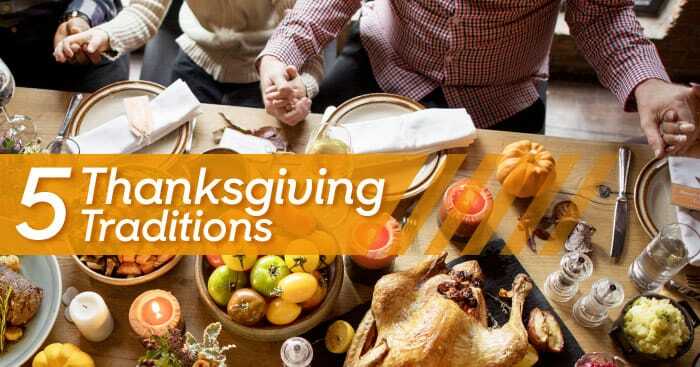 The perfect Thanksgiving happens when you bind family together using the genius talent of your Thanksgiving traditions!